Brunnthal/Munich, Germany, August 30, 2018 – Simark Controls Ltd., a subsidiary of SFC Energy (F3C: DE0007568578), leading provider of hybrid power solutions to the stationary and mobile power generation markets, has received a new follow up order for fully integrated Variable Frequency Drive systems (VFDs) from an existing customer in the Alberta oil sands. The orders amount to approx. CAD 1.1 million. Brunnthal/Munich, Germany, August 14, 2018 – Simark Controls Ltd., a subsidiary of SFC Energy, leading provider of hybrid power solutions to the stationary and mobile power generation markets, has received an order for Trio Radio communication systems from a major Canadian Oil and Gas Company. The order amounts to approx. CAD 0.7 million. Brunnthal/Munich, Germany, July 11, 2018 – SFC Energy, a leading provider of hybrid power solutions to the stationary and mobile power generation markets, has received an order from Calzavara S.p.A., Basiliano, Italy, for SFC Energy’s most powerful industrial fuel cell, the EFOY Pro 12000 Duo. The fuel cell is used as back-up power source for off-grid telecommunication stations. SFC Energy AG (F3C:DE, ISIN: DE0007568578), a leading provider of hybrid power solutions to the stationary and mobile power generation markets, has received an order from a leading international defense organization. The defense organization has ordered the SFC Power Manager as equipment for one of their vehicle fleets. SFC Energy AG (F3C:DE, ISIN: DE0007568578), a leading provider of hybrid power solutions to the stationary and mobile power generation markets, has received a major order from an international defense organization for the delivery of SFC Energy’s JENNY portable fuel cells for use by soldiers in multi-day missions. The order has a total value of over EUR 1 million. Simark Controls Ltd., a subsidiary of SFC Energy (F3C:DE, ISIN: DE0007568578), leading provider of hybrid power solutions to the stationary and mobile power generation markets, has received an EFOY Pro fuel cell order from a new major customer in Canada: The oil and gas services provider uses the fuel cells hybridized with solar modules in a weatherproof EFOY ProCabinet to reliably power of off-grid actuator valves on liquid pipelines. The order amounts to approx. CAD 0,4 million. Variable-speed drives (VSDs) have enabled unprecedented performance in electric motors and delivered dramatic energy savings by matching motor speed and torque to actual requirements of the driven load. Most VSDs in the market rely on a modulator stage that conditions voltage and frequency inputs to the motor, but causes inherent time delay in processing control signals. 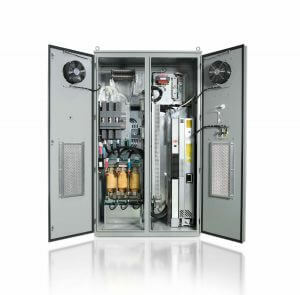 In contrast, the premium VSDs from ABB employ direct torque control (DTC) — an innovative technology originated by ABB — greatly increasing motor torque response. In addition, DTC provides further benefits and has grown into a larger technology brand which includes drive hardware, control software, and numerous system-level features. Brunnthal/Munich, Germany, May 16, 2018 – Simark Controls Ltd., a subsidiary of SFC Energy, leading provider of hybrid power solutions to the stationary and mobile power generation markets, has received an order for Trio Radio communication systems from a major Canadian Oil and Gas Company. The order amounts to approx. CAD 0.7 million. Brunnthal/Munich, Germany, April 24, 2018 – SFC Energy AG (F3C:DE, ISIN: DE0007568578), a leading provider of hybrid power solutions to the stationary and mobile power generation markets, has signed a business partnership agreement with Beijing Green Century Technology Co., Ltd. (Green Century), China. In the context of the agreement, Green Century will sell and service SFC Energy’s EFOY Pro fuel cells as reliable off-grid power sources for powering industrial off-grid equipment in China.